Jan Nimmo has worked as a practising artist since 1985 when she graduated from Glasgow School of Art. 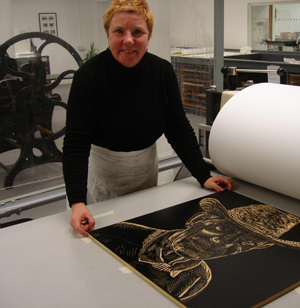 Since then she has exhibited regularly and explored a range of media including drawing painting, collage, printmaking, textiles, installation and film. Her attitude to practice has been influenced by her numerous travels to Latin America. She has researched Cuban traditional popular music, Mexican popular art and culture including the Mexican Calendar of Fiestas, the mythology and the politics of conflict in Guatemala, and the stories of workers on banana and pineapple plantations throughout the region as part of her Green Gold project. 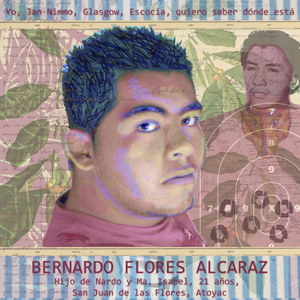 Her most recent project Orfenda: The Faces of Ayotzinapa is a solidaity projects where Jan has created 43 portraits over ten months as tribute to students who were forcibly disappeared in Sept 2014. For more information. To view portraits. The politics of food forms an important strand in Jan's work, from the big agribusiness driven by profit and pesticides to small producers in Spain and Scotland. She herself is a grower and active member of her local allotment association. Another key strand to her work is that of first hand testimony as she sees her role of artist as both bridge builder and as witness. Apart from making her own work Jan offers a variety of services including graphic design and participatory community arts projects tailor-made for groups of all ages and abilities. For more information visit the workshop page. In 2010, Campbeltown born artist, Jan Nimmo, released her acclaimed documentary, The Road to Drumleman, bringing to life the history of the Argyll Colliery which once thrived at Machrihanish. The colliery employed more than 300 men in its heyday, and between 1947 and 1967 was at the heart of the communities of Campbeltown and the outlying villages of Machrihanish and Drumlemble. Jan’s film, which told the story of Argyll Colliery through the personal narrative of the men who worked there, was premiered at Campbeltown Picture House. 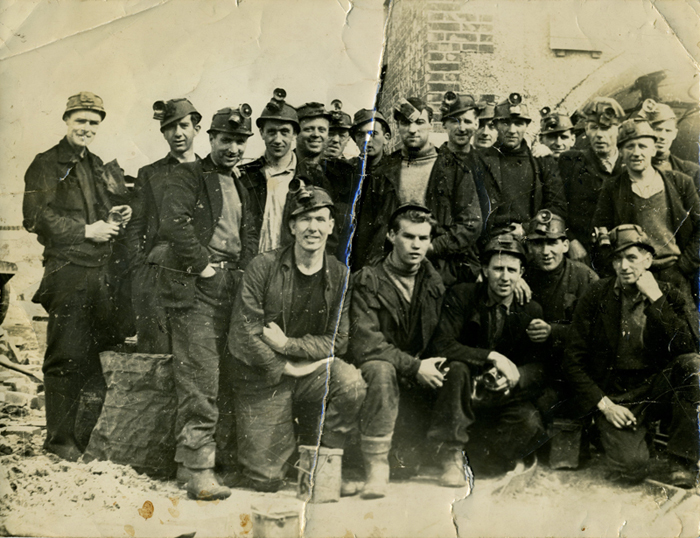 The film brought together the memories of many mining families and took the story of the mine and its men to new audiences through screenings at film festivals around the UK and in Spain, and worldwide via Culture Unplugged. The Road to Drumleman Community Exhibition is a collaborative project involving mining families, local organisations and schools. Jan is working with the support of SKDT (South Kintyre Development Trust) to deliver mining themed creative workshops in three local schools. The resulting artwork will be included in the exhibition. Local miners will visit the schools with Jan. 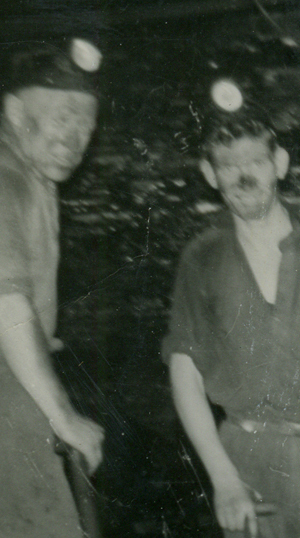 There will be three public drop-in archiving sessions where anyone who either worked at the colliery or who has a connection with the mine will be invited to bring along photos, stories and artefacts. These will be scanned or photographed to create a digital slideshow for the exhibition and may be published on a bespoke blog. Images gathered will form an archive which will be publicly available in Campbeltown and become a legacy for future generations. The exhibition will take place at Glen Scotia Distillery in April 2017, and will include the work done by local children and young people, the community archive material, and a series of drawings by Jan Nimmo portraying many of the Argyll Colliery workers. The project will close with a community event in Machrihanish/Drumlemble in the late summer of 2017. This project is being supported by South Kintyre Development Trust, led by Jan, is funded by Heritage Lottery Fund, Campbeltown Common Good Fund, Laggan Community Council, Tangy (2) Windfarm Trust, Campbeltown Community Council and SKDT, and is also supported by Glen Scotia Distillery, Campbeltown Library and Campbeltown Heritage Centre. 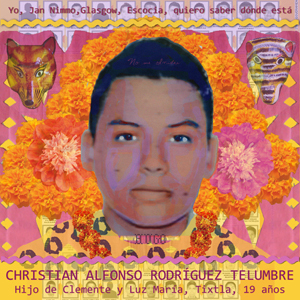 On the 26/27th of September 2014, Mexican students from the "Raúl Isidro Burgos" Teacher Training School in Ayotzinapa were attacked by the police in Iguala, Guerrero. 6 people, 3 of them students, were murdered and 43 students were forcibly disappeared. This tragic event brought to a head the issue of forced disappearance in Mexico (more than 25,000 people since 2007) and sparked a year of protest, international speaker tours with the parents, and an international movement to seek justice for the 43 missing students and the thousands of other people who are counted as “the disappeared”. 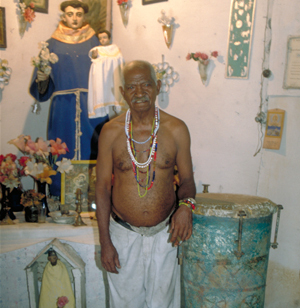 Many years before, Jan had travelled extensively in the state of Guerrero to meet local artisans and musicians and document and record their work and the indigenous traditions and customs of the rural villages and towns where they worked. 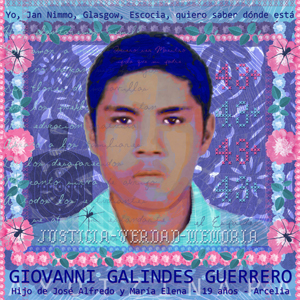 Guerrero is one of Mexico's poorest and most violent states, and in September 2014 Jan was devastated to hear of the attack on the students, who all came from the poorest of backgrounds, and were training to be the teachers of the future, working in the same rural indigenous villages and towns that Jan had visited two decades before. In October 2014 Jan embarked on a series of portraits of each of the 43 students who had been "disappeared". Her aim was to emphasise the human face of the number 43 and to raise awareness, wherever she could, about the appallingly high number of disappeared people in Mexico. Almost a year later Jan has completed all 43 portraits, as well as an additional 3 pieces for the three students who were murdered. Her work is a labour of love, and pays tribute to the students and their parents. To watch video and read more click here. The Lie of the Land project is a slow burning photography/testimony based project which looks at people involved in producing food - from banana workers in Cameroon to small producers in Southern Spain and farmers in Jan's native Kintyre. Through her experience in working closely with banana and pineapple workers in Latin America, Jan has become interested in the alternative, small scale local sustainable food production. She is a member of Plot 16, a mini collective who share an allotment in Glasgow, and Jan believes she inherits her enjoyment of growing food from her father, Neil. As a regular visitor to the Sierra de Huelva, Jan has explored the countryside of the Parque Natural Sierra de Aracena y Picos de Aroche with her horse, Chaparro, on rides that have ranged as far as the Portuguese border in the west, Extremadura in the North and as far as Zufre in the East. During the many hours spent on horseback she has gained an intimate knowledge of the Sierra and the people living and working there. She has been gathering portraits and footage of small producers who rear black Iberian pigs, harvest chestnuts and who produce cork - or in many instances do all three. 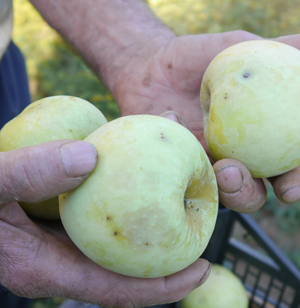 Many families still have growing plots to grow fruit and vegetables for family consumption but this is in decline and very much the domain of older "cachoneros"
As part of the project Jan has made a film about the yearly winter pig kill so typical of that part of Spain. The film, La Chacina de La Suerte, is not only about sustainable meat production - it is also a portrait of the family who look after Chaparro. Over the last 3 years Jan has been documenting the cork harvest in the area through drawings and film. In Buscando América (In Ssearch of America) Jan brought together research she carried out in Latin America to challenge the Scottish perception of "America" and to build a bridge between popular culture in Latin America and Scotland. This involved field trips to Cuba, Mexico and Central America. In Cuba Jan carried out field trips where she met, photographed and recorded interviews with veteran Cuban musicians. She sought out singers and musicians who played many of the genres peculiar to Cuba: son, guajira music, danzón, the cycles of rumba, charanga, trova, changuí and the sacred drum music of Santería. She interviewed numerous musicians including Compay Segundo (Francisco Repilado), Reinaldo Hierrezuelo and Tito Gómez. During numerous visits to Mexico Jan researched Mexican popular art through its artisans and she also linked this to the Mexican calendar of fiestas. The other strand to the project looked at human rights and was essentially the beginning of the Green Gold banana workers’ project. 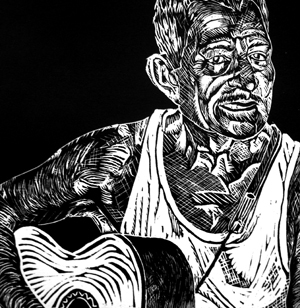 The body of work that came from the project was a series of woodcut/collage portraits and photographs of Mexican and Cuban musicians and artisans from Central and Southern Mexico. Jan very deliberately choose to the medium of woodcut as is was a way of working widely favoured in Latin America (Leopoldo Méndez, Guadalupe Posada), especially in post-revolutionary Mexico. Jan used this technique and mixed it with collage and paint and incorporated fragments from song lyrics and conversations. 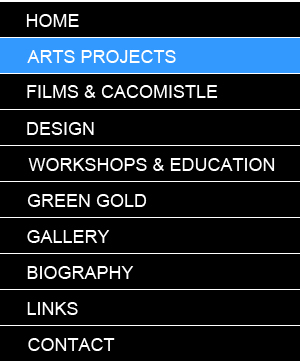 The work was exhibited at various exhibitions, including The Fringe Gallery, Glasgow, and Out of the Blue, Edinburgh. The exhibitions also featured installation and Jan’s first foray into moving image in her edited footage from the San Isidro Labrador fiesta (Dia de los Locos) and of the Soteno family, tree of life artists from Metepec, Mexico. The poet Gerry Loose was a contributor to one of the exhibition events. 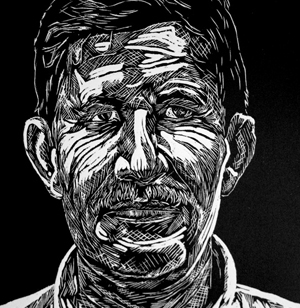 This exhibition of woodcut portraits recorded many of the people whom Jan had met during journeys through various Latin American countries, and included a number of new works portraying banana plantation workers and trade unionists from Costa Rica and Ecuador. It also featured work made about Mexican and Guatemalan mythology and politics. This exhibition was shown at various venues including Art Link's Functionsuite galleries.